MANHATTAN, Kan. –In anticipation of calving season, Kansas State University Animal Sciences and Industry and K-State Research and Extension are planning a series of calving schools beginning in November and finishing up in January. The program will outline the normal calving process as well as tips to handle difficult calving situations. A.J. Tarpoff, K-State extension beef veterinarian, explains the goals of the event are to increase knowledge and practical skills, and to increase the number of live calves born. The schools will also share tips on when and how to intervene to assist the cow and how those times may be different when dealing with young heifers. 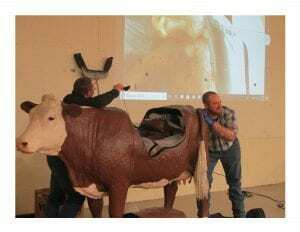 Presenters will also demonstrate proper use of calving equipment on a life-size scale. Several of the meetings will also cover topics such as proper bull/heifer selection and EPDs, winter cow nutrition, and injection site management. Thursday, Dec. 13, Morning, Kingman County Expo Center, Kingman, Kansas; RSVP to Kingman County Extension Office. Wednesday, Jan. 9, Dole Specter Conference Center, Russell, Kansas; RSVP to Midway Extension District Office. Wednesday, Jan. 16, High Plains Education Center, Montezuma, Kansas; RSVP to Gray County Extension Office. More detailed information about the Calving Schools will be posted at KSUBeef.org as it becomes available.